Americans have recently dominated the sport’s major tournaments. Justin Thomas is one of four Americans to win at the past five majors. The United States could only humbly watch in recent weeks as the World Cup, among the most-viewed sporting events on the planet, mesmerized the globe. For those who didn’t drink their fill of overt nationalism, consider that U.S. men rule the roost of a different international sport: golf. A power structure that once heavily skewed European has been reupholstered in red, white and blue as golfers from the U.S. have won each of the past five major championships, dating to Brooks Koepka’s U.S. Open victory at Erin Hills in 2017. What’s more, all four winners in that stretch (Koepka twice, Patrick Reed, Jordan Spieth and Justin Thomas) are younger than 30. And this group doesn’t even include Dustin Johnson, an American in the prime of his career who is also the No. 1 player in the world. 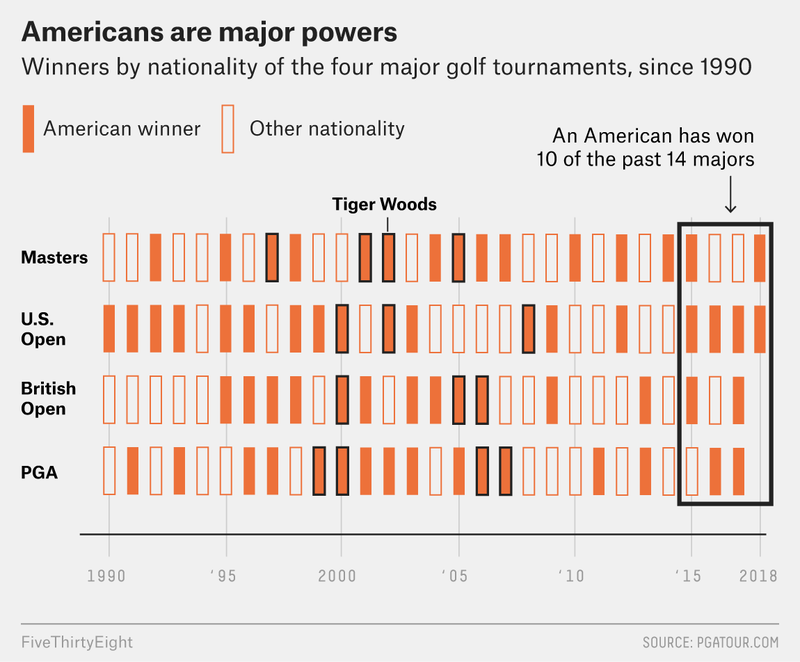 It’s been two decades since the U.S. could claim this kind of dominance: Americans last won five consecutive major championships in 1997-98. That was before the spike of international players joining the PGA Tour, helping to legitimize the global-game mantra touted by the tour’s marketing arm. American success isn’t solely reserved for the winners, either. Seven of the top 11 finishers — including four of the top five — at this year’s U.S. Open were domestic. Half of the eight players who finished in the top five (because of ties) at the Masters were American. Six of the 12 golfers who finished tied for ninth or better at the 2017 PGA Championship were Americans. In total, the U.S. has 13 top-10 finishes and eight top-five finishes at the two majors played this year. Both of those figures project to be the country’s best marks since at least 2010. When the British Open started today, the United States could boast 10 of the past 14 major champions,1 as well as the winner of golf’s unofficial fifth major and three-quarters of the 40 tournament wins on this season’s PGA Tour calendar. Thirty-three of the top 50 players this season in total strokes gained, which estimates how many fewer strokes a player needs per round compared with the average player, are American. The cash is staying in house, too: Americans account for all but two of the top 10 earners on the PGA Tour this season. This U.S. success comes on the heels of the country’s wins at the 2016 Ryder Cup — snapping a streak of three consecutive defeats in a competition that has largely been dominated by the European juggernaut — and the Presidents Cup in 2017. All told, not since 2000-01 could the U.S. claim each of the four majors in succession, plus the Presidents and Ryder cups. Tiger Woods and Phil Mickelson were the only Americans in the top five of the world rankings at that time. Now, the U.S. boasts three in the top five — Johnson (No. 1), Thomas (No. 2) and Koepka (No. 4) — and five of the top seven. Some of this is attributable to the surge of young players on tour who are arguably performing better than any previous generation, which is why there’s no indication that American success will be short-lived. Of the top 100 players on the World Golf Ranking, 49 hail from the U.S., and 55 percent of those Americans are under 33. Admittedly, it would be misguided to call this the golden age of American golf. From 1946 to 1990, the United States claimed more than 75 percent of the major championships.2 From 1991 to 2016, that figure was only 54.8 percent. The United States’ regression coincided with the absence of Woods, fueling innumerable takes concerning the sport’s demise. It seemed Woods not only had the power to turn U.S. golf into a rockstar profession; he could also kill it by leaving. Without Woods, U.S. players couldn’t seem to win any majors, much less string several wins together. In 2011, Americans were mired in the country’s longest major title drought.3 When the streak ended at the 2011 PGA Championship, Keegan Bradley — wearing a red shirt and white pants, with blue water as his backdrop — holed the winning putt and thrust his right arm into the sky like the Statue of Liberty. Since then, the U.S. has found its groove — and the country seems to be stockpiling some of the globe’s top talent. Las Vegas oddsmakers are aware of the trend: Of the 11 players with odds of 25-to-1 or shorter to lift the Claret Jug on Sunday at Carnoustie, six are Americans. Reed, with odds to win at 35-to-1, either flounders or flourishes at the British Open. But he’s the only player with top-five finishes at both majors this season and is coming off a strong showing at the Scottish Open. At 22-to-1, Woods is coming off three top-25 finishes in his past four starts and has dominated this event, cracking the top 10 in almost half of his appearances while making the cut in 17 of his 19 starts. And Spieth, also at 22-to-1, is the defending champion and has always excelled at the Open, making the cut in all five of his starts while finishing in the top 10 twice — even if he has forgotten how to putt. It’s been two months since Rickie Fowler, with odds at 14-to-1, finished outside the top 20 at a tournament. He was in the top 20 at both majors this season, and he’s likely never been this polished in all areas of his game. And Johnson, the favorite at 12-to-1, has cracked the top 10 in three of his nine appearances at the British Open and has eight top-10 finishes in 12 starts overall this season. A win from one of those players, or another of the 54 Americans teeing off at Carnoustie, would mark the first time Americans have won the British Open in consecutive years since Woods went back-to-back in 2005 and 2006. While the current U.S. success rate is not nearly as quixotic as the one manufactured in the decades following World War II, the wave of wunderkinds has bolstered U.S. performance at the sport’s marquee events. An influx of international players hasn’t kept Americans down; if anything, it’s raised their game. Spieth three times, Koepka twice, Johnson, Reed, Thomas, Jimmy Walker and Zach Johnson. That figure would have been much higher had South African Gary Player not been an all-time great.